Heralded as “the most important choreographer in Asia”, LIN Hwai-min often draws his initial inspiration from traditional Asian culture and aesthetics, but he doesn’t stop there. With dancers trained in meditation, Qigong, internal martial arts, modern dance and ballet, his Cloud Gate Dance Theatre of Taiwan transforms the ancient aesthetics into thrilling modern celebrations of motion. Now, for the first time since 2003, LIN returns to Seoul and stages his recent production, ‘Rice’. 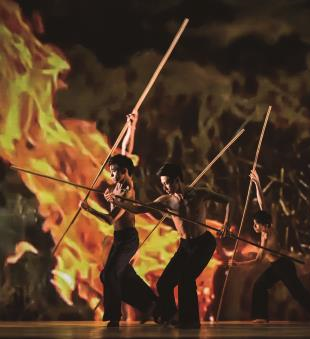 Inspired by the captivating paddy fields in Taiwan’s Chihshang, the dance epic is a remarkable tribute to the land and nature, and also celebrates the 40th anniversary of Cloud Gate. The production pairs breathtaking images with a poignant view of seasonal life to touch the heart. This entry was posted in Activity & Local Culture. Bookmark the permalink. The Height of Luxury- Maison Hermes Dosan Park!